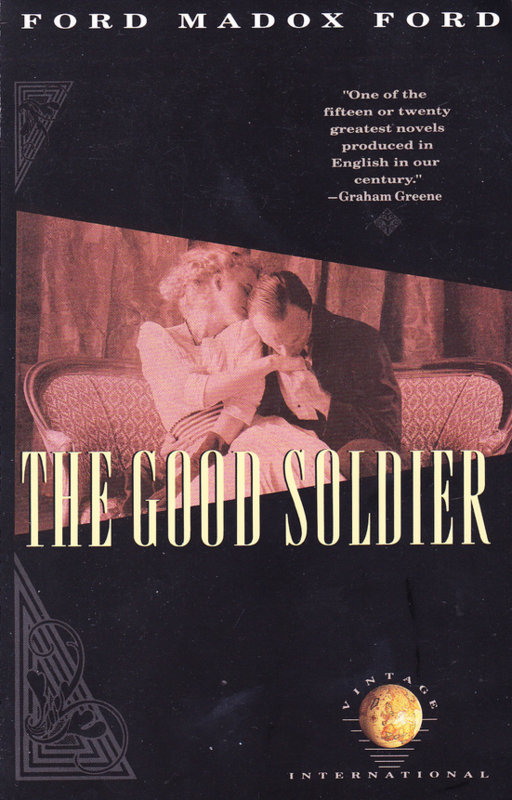 The modern masterpiece few can agree on, Ford Madox Ford’s “The Good Soldier” has nevertheless weathered a century of criticism, critique and confusion. This should be one of the greatest and most memorable opening lines of any novel, right up there with “Call me Ishmael,” “It was the best of times, it was the worst of times,” “Mother died today,” and “Stately, plump, Buck Mulligan…” (if you are a big Joyce fan.) But unless you took a course in The Modernist Novel, there’s a chance you missed Ford Madox Ford’s opening salvo from his 1915 novel The Good Soldier, which turns 100 this year. How to account for this oversight? Literary scholars and professors can (and do) go on and on for seemingly endless pages and symposia on this topic, but for our purposes, we can limit our scope to the literary company Ford (born Ford Hermann Hueffer) kept: there’s the famous photo of him with Ezra Pound and James Joyce in the former’s rooms in Paris c. 1923: Ford is reading and E.P. and Joyce look a bit bored. Despite being a publisher of a couple of very influential literary journals, Ford was never (quite) in their league. Then there’s the fact that Ford, who collaborated with the Polish-British novelist and short-story writer Joseph Conrad, wound up playing Braques to Conrad’s Picasso. And, finally, there’s no escaping that, while Ford was on a first-name basis with many of the most important and popular writers of the first part of the 20th century — D.H. Lawrence, H.G. Wells, and Wyndham Lewis (in addition to the above) — he was also eclipsed by their stardom. Not that Ford was then or is now a forgotten figure of 20th century English literature: HBO and the BBC did a splendid job of translating his other major work, Parade’s End (aka “The Tietjens Tetralogy”) to film with the help of Tom Stoppard in 2012. If you’re in the right mood, it’s a little like Downton Abbey with none of the silliness, and much more gruesome World War I scenes. 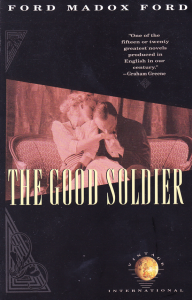 There’s a 1981 movie version of The Good Soldier, too, but unlike Parade’s End, it’s pretty forgettable. Still, it’s The Good Soldier that has weathered the best of all of Ford’s eighty books (he published his first book at 17 and apparently never stopped publishing, let alone writing.) And this tone-deafness to his own work has helped to bury The Good Soldier a bit, too. And therein lies the shame: while Ford certainly was quickly overshadowed by Joyce’s A Portrait of the Artist as a Young Man and Ulysses (both of which came later), and Lewis’s Tarr (later) and Woolf’s debut that same year, 1915, The Good Soldier isn’t as experimental (read: incomprehensible) as Joyce, or as show-off-ish as Lewis or as cerebral as Woolf. In fact, it seems downright approachable, if not welcoming. At least at the start. But the “problem” with The Good Soldier, to paraphrase G.K. Chesterton, is not that it is rational, nor that it is irrational, but that it is almost rational. It’s a book that almost makes sense, that is almost believable. It is almost Modern, but is still recognizable, and has not disappeared into the undertow of the stream of consciousness of Joyce, Woolf, and Faulkner. So he goes ahead and does both. Surrounded by the building of the edifices of High Modernism on all sides (Proust’s Remembrance of Things Past was well on its way in Ford’s beloved France; Pound’s first Cantos had appeared, and in Germany Thomas Mann’s towering Magic Mountain was slowly taking shape — his Death In Venice appeared the same year as The Good Soldier), it is commonplace to refer to The Good Soldier not so much as a “Modern” novel, as it is an “Impressionistic” one or “Edwardian” one — though I confess I’m not sure what is meant by these assessments. Or if they are really even applicable, let alone helpful. Another assessment of The Good Soldier that I find strange is Graham Greene’s “blurb” — it’s on the front cover of the Vintage edition: “One of the fifteen or twenty greatest novels produced in English in our century.” Greene, who was indeed a fan of the book, can’t seem to make up his mind here: is it 15 or 20? As anyone who has suffered through College Football rankings will tell you, it’s a big difference between ranked 15th or 20th. If nothing else, The Good Soldier: A Tale of Passion has definitely stayed in print for the past century while defying easy categorization. For a book so full of death, dying, and infidelity there’s a lot of laughs in it, too: my personal favorite being “Spanish women are horrors at thirty.” A line I use with my Spanish wife, who finds both it and the book decidedly un-funny. And therein lies its weird charm: The Good Soldier is different, even contradictory, things to different readers — and maybe the closest parallel here is Edmund Burke’s Reflections on the Revolution in France, which has defied classification for 225 years, and been co-opted by every possible political faction as their rally cry.